Well, it’s that time again…the time for flowers, cards, dinners and memories….that is if you’re lucky enough to still have them. This entry isn’t going to be about how much I miss my Mom or how sad and depressing life is without her by my side. No, this entry is going to be about all the reasons why my Mom deserved to be recognized on this day, not only for being a Mother, but for sacrificing her life so that I could have one. My childhood was nothing short of amazing, and I have my Mom to thank for that. I’m not going to lie, thanks to my Mom and Grandpa I was very much spoiled. My Mom was what you would call a jack of all trades, she did everything. When she wasn’t at her job she was either with me or at my school helping with PTO, she never had an off button. Her goal in life was to help make my childhood memorable and she did just that and more. I remember every holiday my Mom would create treat bags for my classmates and I couldn’t tell you how many kids would run up to me and tell me how much they loved having me in their class because they knew my Mom would give them gifts. Not only was she a huge part of PTO, but she also coached basketball, cheer-leading, girl scouts and she was always willing to help me with my tennis and bowling skills. Like I said, this women did everything and she made sure not to miss out on any part of my life. When I say that this woman was super Mom, I mean she was super Mom. She was also an active member in the community. She designed and made all the church bulletins for our church every Sunday, she organized and helped plan out activities throughout the town and she was the regular Pinterest, always making crafts. Back when I was little I would get embarrassed because my Mom was always around and wanting to be apart of everything I did. Now all I can do is brag about how much she was apart of my life and thank God everyday for blessing me with such an incredible Mother. She was the kind of Mother that knew you had a bad day without words being said and baked you brownies, she would binge watch bad Sci-Fi movies with you on Saturday nights and laugh at the horrible special effects, she would drop everything to make sure you were alright, she was the type of Mother you always wanted and the type of Mother you hope to someday grow up to be. I could tell her anything and I knew she would never judge me. If I was sad she was there to pick me up, if I was happy she was there smiling with me, if I needed advice she was always on hand to give me words of wisdom and I loved that she was so brutally honest. God really does take the prettiest flowers first. Even as my Mom’s health declined she still held her head high. She took care of my Grandpa and me and still continued to try and make my life enjoyable. I never told her this, but I admired her so much, I looked up to her and with every decision I made I always thought ‘what would Mom do’. She is my inspiration, my idol, my rock…..she is my Angel. I wish I would have hugged her more, pushed her more and loved her more. Sue Cress, I hope when you hear that name you think of kindness, generosity, respect, strength, determination…but most of all I hope you think of love because that’s all she ever gave and she never got enough in return. With all the things left unsaid when she was alive I hope now she can watch from above and know that with every ounce of love she gave me I gave it right back to her. I love you so much Mommy, and I never showed it enough and for that I am sorry. I could write forever and still not express how incredible you are. I can’t wait to join you in that sky and see you walking, flying and healthy…. 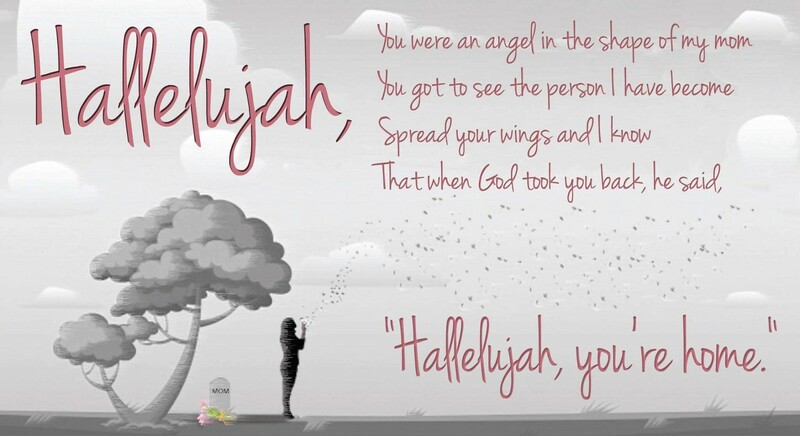 I can’t wait to see the angel you truly are, your wings must be big because your heart sure was.